Me: I'm going to take some photos of my shawl. Bill: I can take them -- you go to the very end of the garden, and I'll stand at the back door and see if I can fit it all in. I feel a real sense of accomplishment with this project. The pattern was a challenge, with two elements I'd never done before: lace patterning on both RS and WS rows, and a knitted-on side-to-side border. I think it's my most difficult project to date. As I was blocking it I was a little scared by the size, but the second I draped it around my shoulders, I was in love. I still love all those small shawls I listed in my last post, but I want to marry this giant shawl. I also want to keep knitting challenging lace. It's very satisfying. Wow is that gorgeous! 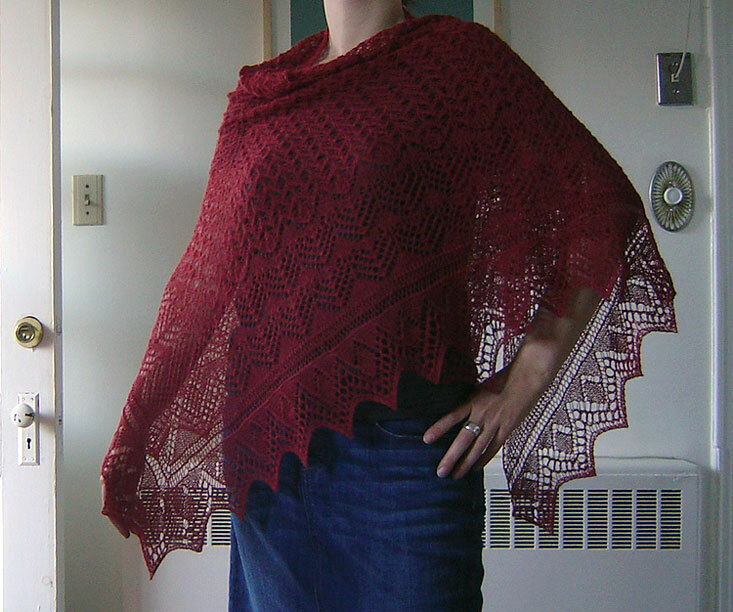 What an impressive shawl! I love the colour. May I be the first to congratulate you on this magnificent shawl. Well done! This shawl is simply stunning! And I love how huge it is - much prefer it to the original photo you linked. Partly because I'm feeling a little cold right now and the small shawl makes me feel colder just to look at it! Congrats on finishing this beauty! oh wow. this is gorgeous. it is just breath taking!! This is stunning! Congratulations on this knitting achievement! It may be huge but it's GORGEOUS! How are you doing hun! Long time no see! Maybe we can catch up sometime soon? It's beautiful, and very impressive! That is a HUGE amount of knitting! way to go. Beautiful!! I love the colour and the size. What a lot of work you put into your gorgeous shawl. Where do you think you will wear it? That is an absolute masterpiece! Your version is just stunning, I think using the laceweight in the cobwebweight pattern has worked beautifully. You are a lace fiend! It's lovely. It's absolutely gorgeous. You can be pride of yourself!!! Beautiful! 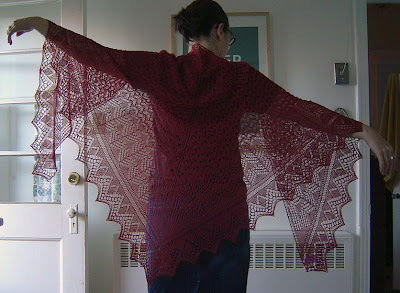 It's a huge accomplishment to make a "true" (patterned on WS and RS) lace shawl! incredibly beautiful shawl!! What an accomplishment! Your shawl looks amazing! Nice colour, too. Gorgeous. I have done a simple knitted on border, but still haven't tackled lace patterned on both sides. Would you say that even with the patterning it was within the realm of TV knitting? Your shawl is amazingly beautiful. It must be great to wrap something so beautiful completely around you! You should be very proud. Hooray to you for taking on some new challenges with technique! This looks so beautiful! Thanks for sharing! Beautiful shawl! I'm amused that your last post got the rest of us focused on small shawls and then you bust out this big baby! Gorgeous gossamer wings! What a beautiful, complementary colour for you, as well. That is spectacular. Have you ever tried to make lace? I would imagine that your pattern would allow you to do that on a smaller scale... really wonderful meticulous work. I'm jealous. Wear it well and enjoy it. Wow. That truly is an amazing accomplishment! Gorgeousness! Where are you Brainy? - miss all your wonderful blog posts. Love the shawl but when are you coming back? Hey, we miss you! Please come back.